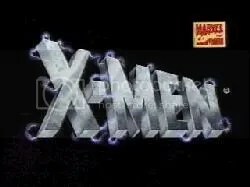 One of the best (if not the best) animated series ever made is the 90’s X-Men series. Vastly superior to the recent “Evolution” series, it baffles me to this day why they haven’t released decent DVD volumes of this classic Saturday morning fare, especially with the success of the movie trilogy. The stories, the action, the massively appealing characters all made this a series both kids and adults can appreciate. I to this day at the age of 23 can’t get enough of episodes I’ve seen dozens of times over the last decade and a half. 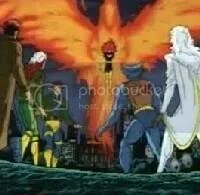 As the Phoenix entity in Jean’s body lingers on, a society of mutants and cyborgs called The Inner Circle intend to use that power by manipulating her through hallucinations. When that fails the Dark Phoenix emerges and becomes a threat to the entire galaxy. The X-Men must fight to save Jean’s life as the Shi’Ar Empire desires to destroy her to save the universe. This is by far the best adaption the series did of a story originally done by Chris Claremont in the comics. It’s literally like seeing the comic panels come to life, I especially enjoyed part 2, where we got to see Wolverine’s classic Dirty Harry speech word for word. Now true the ending in part 4 has been completely altered but that’s excusable when the rest of it is so well done. Absolutely the best. With so many other fantastic episodes in the series, one can only hope that one day we’ll see complete season DVD boxsets released. Until then, however, I’ll have to keep perusing my eBay bootlegs. Remember the candy that had a very sour coating then the sour flavor fades after about 20 to 50 seconds? The flavors inlcude Apple, Black Cherry, Blue Raspberry, Lemon and Watermelon. Rainbow Chaser – a brown horse with purple hooves. Hollywood Bear – a bear in a tuxedo and a top hat. Panda Painter – a panda in overalls who paints things with a large paintbrush. Ballerina Bunnies – three rabbits who dance ballet. Max Splash – an orca whale. Markie – a unicorn with rainbow mane and tale. Roary – a polar bear. Hunter – a young leopard. Spotty and Dotty Paws – two dalmations with rainbow-colored spots. Peekaboo – a turtle with hippie-style flowers on its shell. Skye – a Pegasus-like flying horse. Ruckus, Raider, and Risky – three St. Bernard puppies. Casey – a golden retriver puppy. Here’s a video sequel to our Lunchbox Treats: A List entry (see the December archive). Feast your eyes upon the chocolatiest cookie in town! Bad pun, bad pun. I meant BOP the magazine and not the song popularized by Hanson. 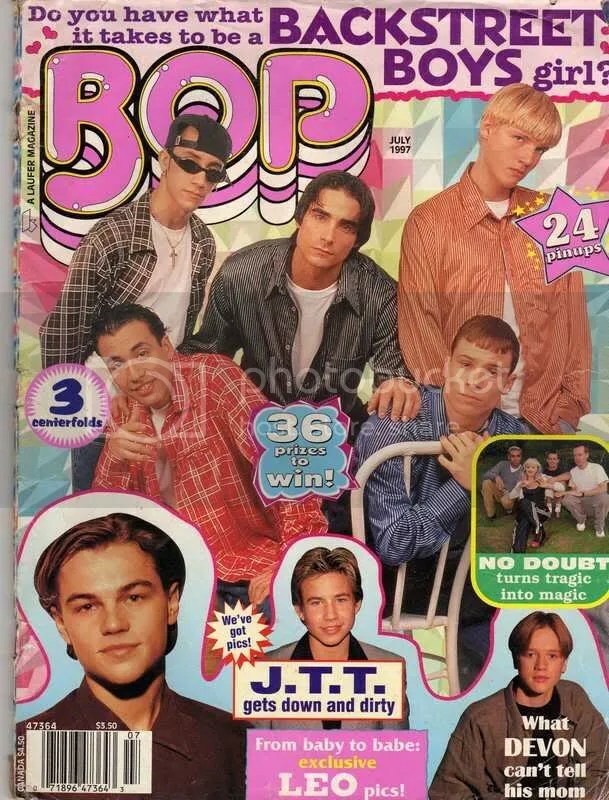 The picture I included here was my first and last issue of BOP, the teenage magazine in the nineties. I used to go gaga over the free pinups of the teen stars. Of course back then in the mid-nineties when I was in the sixth or seventh grade the movies Clueless, Now and Then, Camp Nowhere, and Mighty Ducks were in VOGUE! Plus the TV shows Sabrina, Sweet Valley High, Moesha, and the Fresh Prince of Belair was deemed cool by the Cool Crowd. Wanting to be ‘in’ and not left behind, I rode the wave of watching foreign shows. As a teen, I used to have daydreams that starred Devon Sawa, Andrew Keegan, Luis Mendoza (that kid who can’t stop in Mighty Ducks 2), and Jonathan Jackson. All of them at one point of the daydream, had to profess their undying love for me. And we lived *ulp* happily ever after! Tsk, tsk, cheesiness abounds. I’m sure all you Kidswereus readers are smart enough to figure out why this magazine’s popularity waned. Won’t you join us in enumerating the why? The funniest and most creative wins! Growing up with Boy Meets World. Who can remeber Boy Meets World? I remember watching Cory Matthews’ funny antics with his best friend Shawn Hunter and his girlfriend Topanga Lawrence.